Sweet strawberries and tart sun-dried tomatoes mingle nicely with fresh basil leaves. They’re then dressed with a light and tasty balsamic vanilla vinegar and topped with almond slices. I’ve always been a salad girl, but it’s only been the past few years that I’ve started to enjoy when fruit is included with my veggie salad ingredients. Now that I’ve realized how much I love the sweetness that fruit can bring to a savory salad, I find I’m hard pressed to enjoy a strictly veggie salad ever since. Bring me the sweet. Bring me the savory. Bring me the salad! This Strawberry, Sun-Dried Tomato, and Basil Salad is a complete 180-degree turn from my usual loaded veggie salad with a bit of fruit added at the end. In this salad, the strawberries take center stage with their soft, sugary sweetness. The sun-dried tomatoes add a chewy, tangy, salty bite. The fresh basil adds the light aroma of spiciness and a mild licorice flavor. The balsamic and vanilla vinegar adds sweetness with a floral note, compliments of the vanilla, and, of course, the almonds add crunch and extra texture. And as salad lovers know, it’s all about the texture. -In a small bowl, stir together the balsamic vinegar and vanilla. 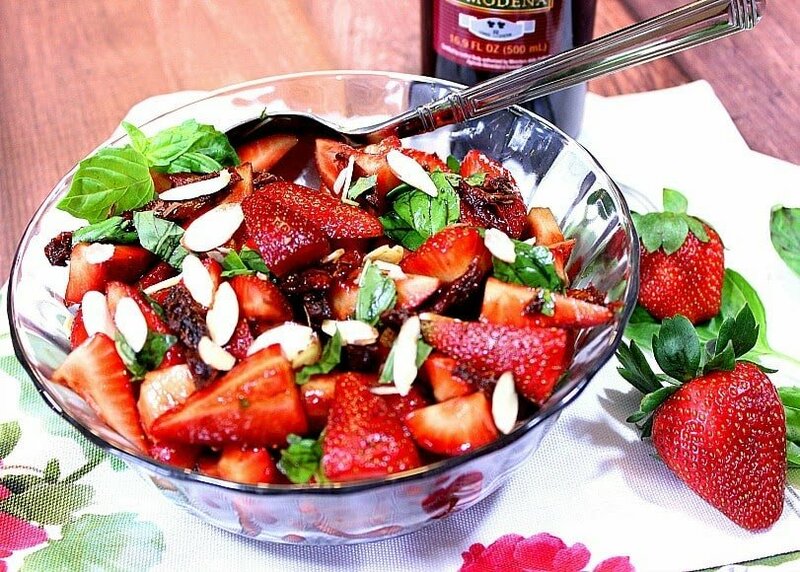 -In a medium bowl, stir together the strawberries, sun-dried tomatoes and basil leaves. -Pour the balsamic vinegar mixture over the berries and tomatoes and stir to combine. -Sprinkle the almonds over top and serve immediately. Serve this Strawberry, Sun-Dried Tomato, and Basil Salad as a dessert after a light summer supper by topping it with a dollop of whipped cream. Or serve this salad as a side dish to a simple pasta or fish dish to keep things on the lighter side when the hot weather hits and you don’t feel like eating anything heavy. Either way you choose to serve this fresh and delicious salad, I promise you won’t be disappointed. I find this salad tastes best when served at room temperature. 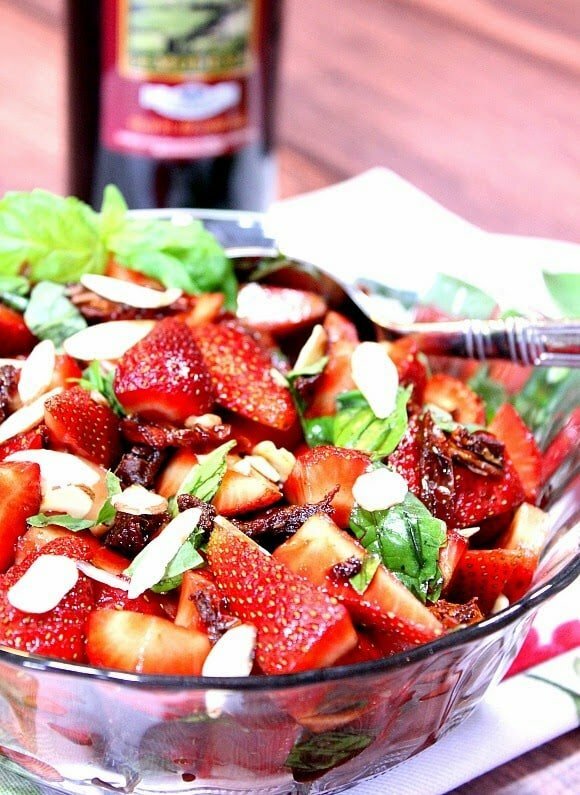 However, if you need to make this salad in advance of when you plan to serve it, you can assemble the strawberries and sun-dried tomatoes in a bowl and pour the balsamic vanilla vinegar over top. Stir well and refrigerate. Allow the salad to come to room temperature. Stir in the basil and top with almonds. Serve. I can't wait to try this absolutely gorgeous salad when this weather finally warms up here! Oh, this is my kind of salad! Beautiful!! I'm the same way…I want lots of different flavors in my salad, from sweet to savory, to keep things interesting. This is definitely a salad I would enjoy! 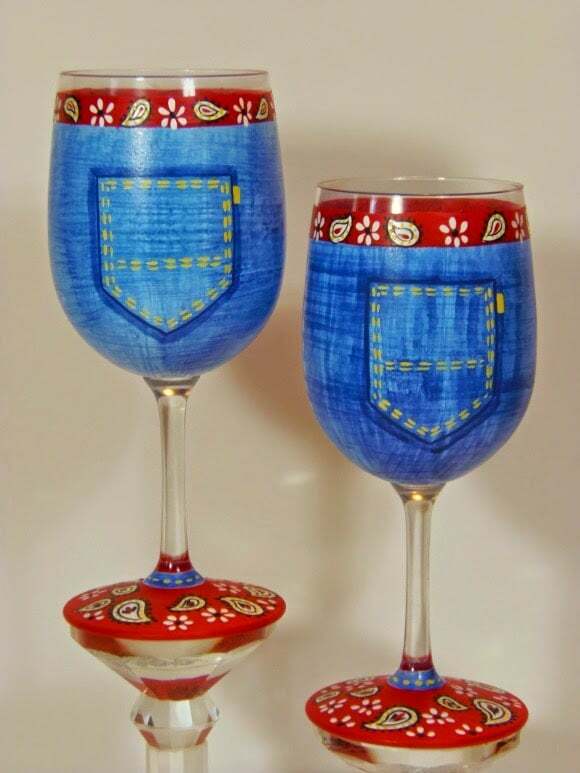 Those glasses are adorable! And what a great idea for a spring picnic salad, love it! First, let me say that this salad is absolutely beautiful, I love the red on red. I'm loving the sweetness of the strawberries again the tangy, chewy sundried tomatoes. I have to try this! beautiful salad filled with so much goodness! There is nothing that I love more than salad with fruits in it! 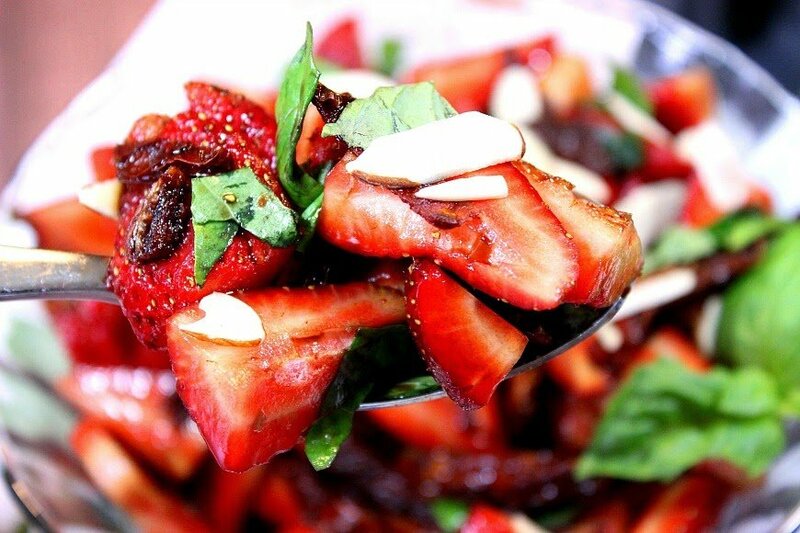 The balsamic, strawberries and basil will mingle quite nicely together! I always enjoy a good fruity salad! 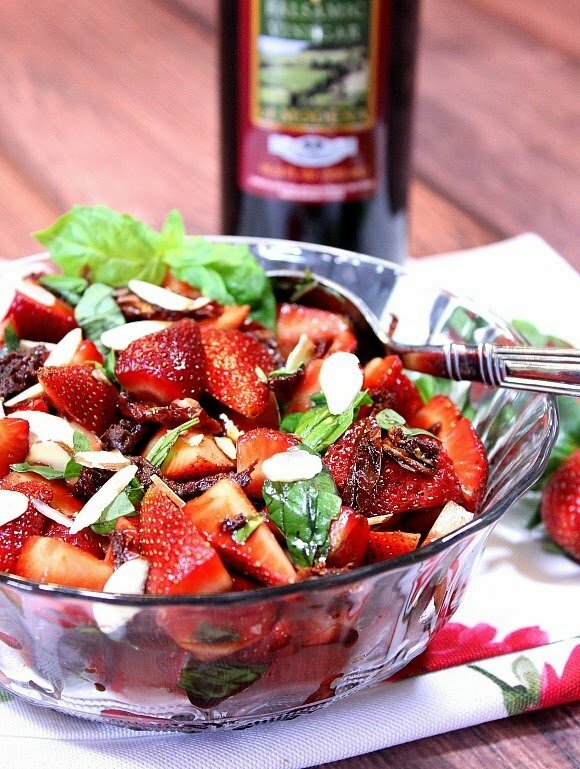 Strawberries and balsamic vinegar are such a classic combination and the basil would make a fantastic addition! Great recipe! This salad is making me long for warm summer days. It actually snowed here yesterday (SNOW!) so I'm sooooo looking forward to sweet strawberries and leafy green salads. I love salads that mix up the sweet, savory and salty. This sounds delicious! I've gotten to the point where I don't even want a salad if it doesn't have fruit in it! Strawberries are one of my favorites too! love it! I would of never thought to add strawberries and sun dried tomatoes together! Sounds delicious!